Several years ago, I owned this wonderful sweater that I liked to wear during the winter. It fit me almost perfectly, the color of it matched my complexion, it wasn’t itchy at all, and I loved the pattern. As much as I liked it, though, I ended up wearing it only once or twice a winter, and I eventually ended up giving the thing away. Why? It required individual washing. 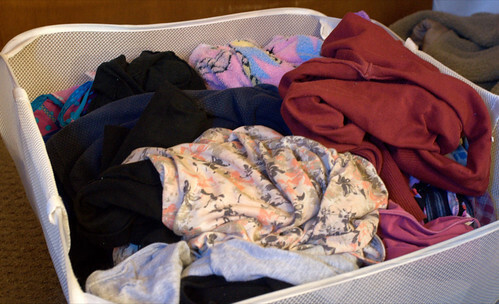 Every time I would wash the item, I couldn’t help but run the numbers on the extra time and money this sweater was costing me, and when I compared that side-by-side with a nice article of clothing that didn’t require such extra care, I always leaned toward the item that was easier to care. At the time, Sarah and I lived in an apartment that had a coin-operated mini-laundromat in an adjacent building. To do your laundry, you would carry a basket of clothes over there, pop four quarters in the washer, come back in half an hour, pop four quarters in the dryer, and come back in about an hour. Two bucks, you say. Big deal. Let’s think this through, though. Let’s say I would wear this sweater five times a winter for five years. Each time I washed it, I need to use some cleaning agent, costing (say) twenty cents. Also, I’m going to have to devote, say, five minutes each time to the process of washing it. Just to wear this item regularly as described above, I’m spending an hour and forty minutes just cleaning that shirt and spending $55 in the process. Even if I had my own washing machine and air-dried the shirt, I would still be spending about $18 over the life of the garment just for washing that one item (over 25 washings). That realization led me to try other methods of cleaning it. Hand-cleaning worked wonderfully and saved considerably on the money side of things (I just needed the cleaning agent), but significantly increased the time investment. Having a cleaning service do it would have been even more expensive. Eventually, I found myself wearing it perhaps once per winter, cleaning it afterward, then talking myself out of wearing it for the rest of the winter. I eventually donated it to charity. The immediate response people might have to this experience is that I was being lazy or cheap. Regardless of whether or not that’s true, there is a significant additional financial cost and time cost to washing items individually that adds up over time. That’s why, given a choice between adding a garment I can wash normally to my wardrobe or adding one that requires individual washing, I’ll always lean heavily towards the one I can wash normally. It devours significantly less time and less money over the long haul. I do still own multiple garments that require special cleaning, but I rarely wear them. All of the “special care” items were gifts. When the opportunity comes around to wear them, I often can’t justify the time and expense when there are many other wonderful items I can wear that don’t require specific cleaning methods. Why not just wear that nice shirt I can launder with everything else? This response winds up informing my shopping practices. If I see an item with special cleaning instructions, I’m simply very likely to skip it. Special cleaning instructions have a cost, both in time and in money. Keep that in mind when purchasing clothes, and don’t be afraid to look for similar items that don’t require special practices.